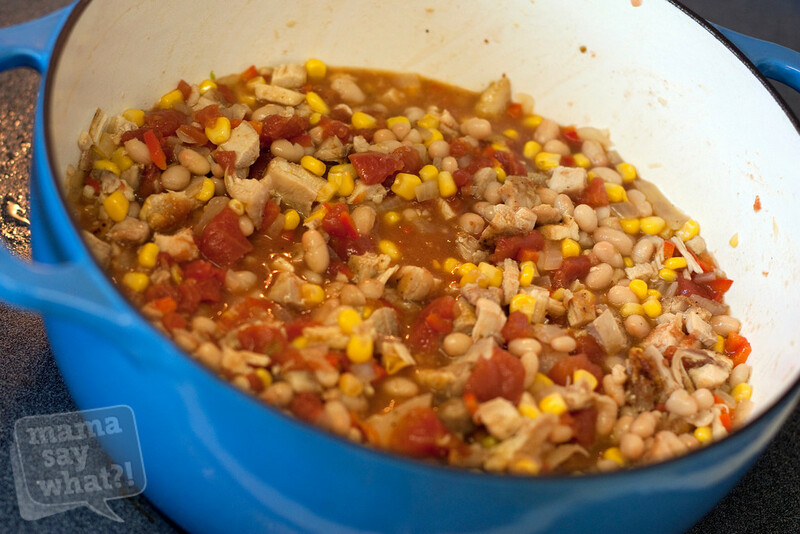 Chicken, White Bean & Corn Chili Mama Say What?! | Mama Say What?! I have no idea where my brother got this recipe. He made it for our family one day a few years ago and paired it with some moist cornbread on a cold, rainy night. I have never really been a big fan of chili, but man— I was hooked. Mama Say What?! 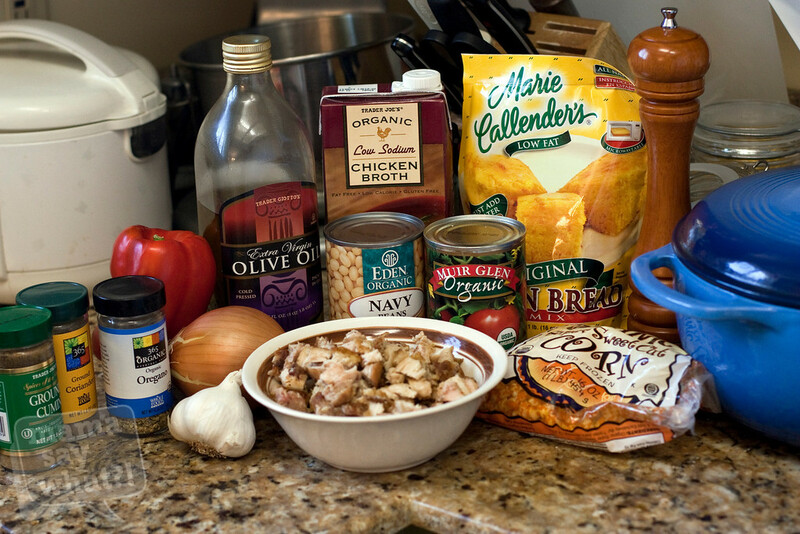 Mama Kathy S. has already shared her slow cooker version of a delicious white bean chicken chili. This is my version. It is a little different and is cooked in a soup pot rather than a slow cooker. I have adjusted this recipe to feed a family of three or four, depending on how much you and your kids eat. I have also made a few changes from my brother’s recipe to suit the tastes of our family. The batch my brother made could easily feed seven or more. Cook the onions, red pepper, and olive oil over medium heat in a heavy soup pot until the onions are translucent. I love to use my cast iron enameled dutch oven for this. Add the garlic and cook a couple more minutes. Add the spices and stir to incorporate. Add the corn and stir to incorporate. I like to let the corn cook for a couple of minutes, stirring occasionally. Add the chicken broth and stir, scraping any brown bits off the bottom of the pot. 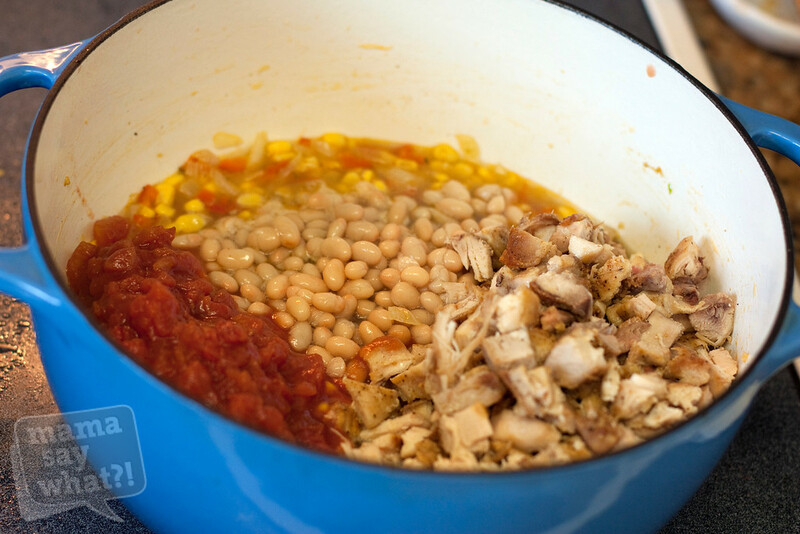 Add the tomatoes, chicken and beans and stir. Cover and bring to a boil, stirring occasionally. My kid is a little picky when it comes to the tomatoes, so I try to find a can of the petite diced tomatoes or I dump a can of regular diced tomatoes onto my cutting board and dice the tomatoes some more. Lower the temperature to simmer the chili for another ten to 15 minutes, covered. Taste it and adjust with salt and pepper. I usually add a lot of black pepper because I like a lot. I have even been known to add more coriander and some smoked paprika. Use whatever works for you and the palates of your family. 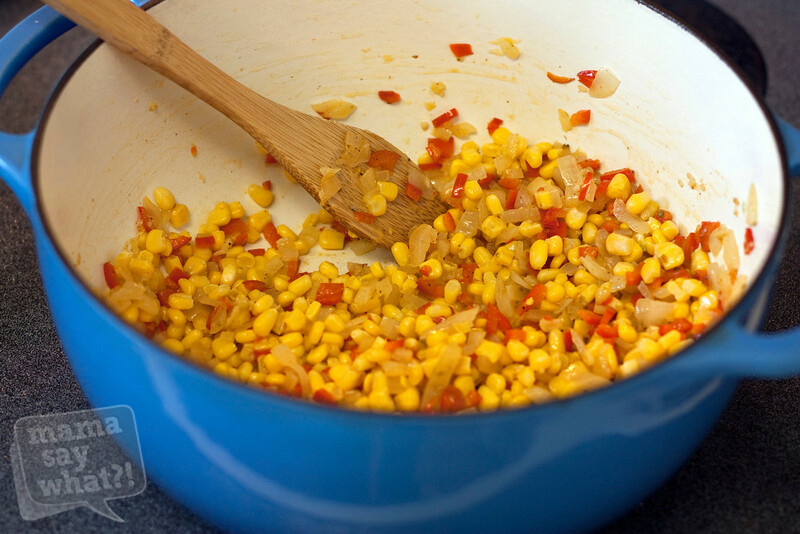 You can substitute the red pepper for a small can of diced green chiles, or use both. The green chilies make the chili a little too spicy for my three-year-old, but taste just as yummy for my husband and me. 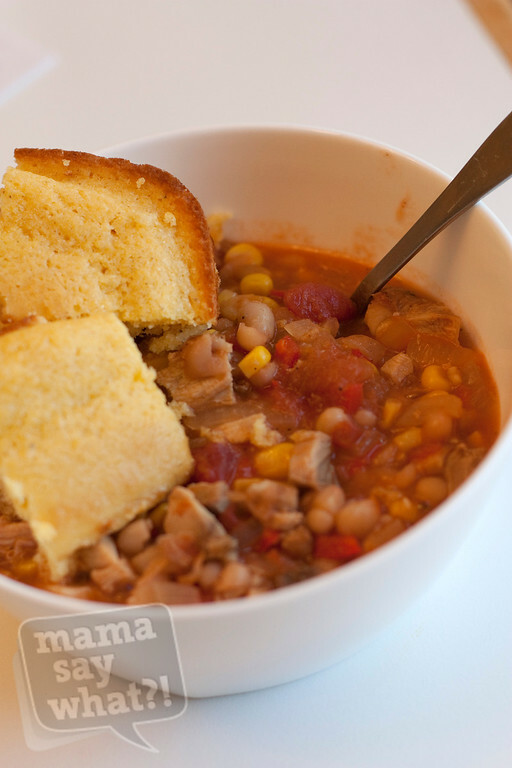 I love to eat this with cornbread; I stick the chunk of cornbread right into my bowl of chili. I adore Marie Callendar’s Cornbread Mix. It is super easy— just add water— and can even be cooked in your microwave if you don’t have time to heat up your oven. It is seriously the best and totally worth spending a couple of extra bucks versus the inexpensive Jiffy brand. If you want to add a little more volume to this recipe but don’t want to double it, you can use two cans of white beans or one can of white beans and one can of white kidney beans (aka Canellini beans). 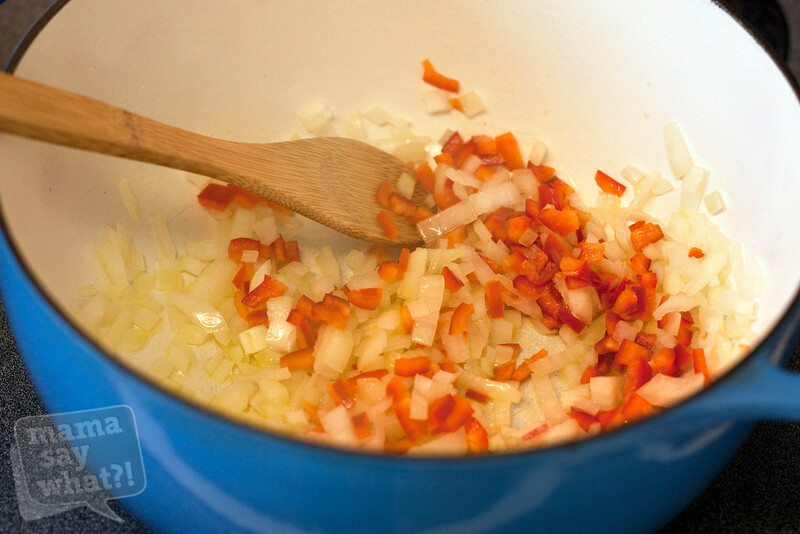 Cook the onions, red pepper, and olive oil over medium heat in a heavy soup pot until the onions are translucent. I love to use my cast iron, enameled, dutch oven for this. Add the garlic and cook a couple more minutes. Taste it and adjust with salt and pepper. I usually add a lot of black pepper because I like a lot. I have even been known to add more coriander and some smoked paprika too. Use whatever works for you and the palates of your family. 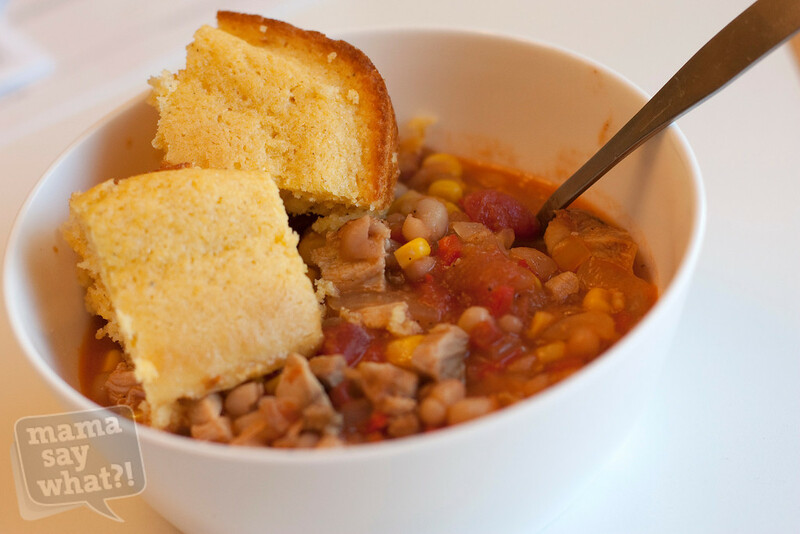 I love to eat this with cornbread, I stick the hunk of cornbread right into my bowl of chili. I adore Marie Callendar’s Cornbread Mix. It is super easy, just add water, and can even be cooked in your microwave if you don’t have time to heat up your oven. It is seriously the best and totally worth spending a couple of extra bucks for versus the inexpensive Jiffy brand. If you want to add a little more volume to this recipe, but don’t want to double it, you can use two cans of white beans or one can of white beans and one can of white kidney beans (aka Canellini beans). Added by Alex T. on May 17, 2013.